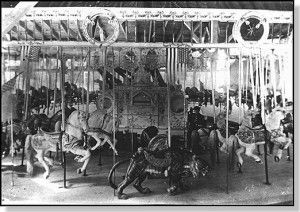 The carousel (merry-go-round) is seldom seen today, but 100 years ago they were found everywhere. Many towns and most big cities had a municipal carousel and every carnival or fairground had one. Many carousels were dismantled and moved frequently. All traveling shows had to pack up the carousel and move it to the next town where it would be an attraction for thousands of people to come enjoy the fair or carnival. The original carousels were quite fancy and were really over the top in decoration and color, mirrors and electric lights even before electricity became common. People really enjoyed riding a carousel but by today’s standards they are rather tame. When they were new they were the most exciting form of fairground rides. There was one thing that was paramount to a carousel being so popular and that is the music for the carousel. The music was most often generated by an automatic organ integrated into the decorative center, the heart, of the carousel. The Carousel organ was loud enough to attract a crowd. They can often be heard half a mile away. Often with several carousels they competed for an audience with their music. These organs were size appropriate to the carousel. In the largest carousels the organs were quite large and in the smaller carousels the organ might be really small. Most carousels were of a medium size and there were many organs of moderate size to furnish music for the thousands of carousels out there traveling from town to town. Of course to ride the carousel you had to buy a ticket. Many people made their living selling carousel tickets. It was quite lucrative because carousels were extremely popular and everyone rode the carousel when it came to town. Everyone enjoyed listening to the popular music of the day played on the carousel organ. Carousels were not the only venue where band organs were found. Dance halls, classy ballrooms, and outside fairgrounds all had to have this source of music. Like the carousels their integral organs had to be packed up and moved to the next town. Many such carousel organs had extremely hard lives. Many of them did not survive the abuse of constant moving from town to town. When they did survive they were often maintained poorly or were kept working by using bailing wire and chewing gum. The fact that these organs were able to keep playing for decades was a testament to how WELL they were constructed and designed. Since these organs had to keep playing to make money they often have many coats of paint on them as styles and trends changed over the years. The surviving organs all must be restored at some point. Recently I did such a restoration on a Wurlitzer 145B carousel organ. The organ had several coats of paint on everything. The dirt and grime coating everything in the organ was phenomenal. The case was coming apart and the veneer was loose and falling off. Someone had replaced the legs with some junk wood years ago and the drum platforms (wings) were barely holding together. Many things had been patched and patched again and again. During restoration we made new legs and mostly-new drum wings keeping the wooden parts that were restorable. Major cleaning was done but the wear to the metal mechanical system that runs the two paper rolls that play the music was the worst for the ravages of time and lots of use. These parts are mostly made from cast iron with brass gears and steel drive rods. All of these rods had worn themselves thin from decades of use. They had worn their bearings into egg shaped holes. We had to find a really good machinist who made new bearings and bushings for all these spoolframe rods. He made all new parts so that this organ will play like it did when new for many decades to come. Here is the organ as it sounds today. Now all it needs is the color selection and let the artists paint it up like it was when it was new in 1927. Here is the before and after time lapse video of its first day and its last day in the Piano World shop. WARNING! This may be a painful listen as it sounded really bad when we first got it into the shop. I enjoy restoring Band Organs and Carousel Organs and my shop does a pretty good job of it. With all the shops that do this kind of work slowly shutting down several every month, anybody who has an automatic organ or piano or wants one needs to contact me to get yours restored for another lifetime of the happiest music on earth. If you are looking for one I can probably find you one. 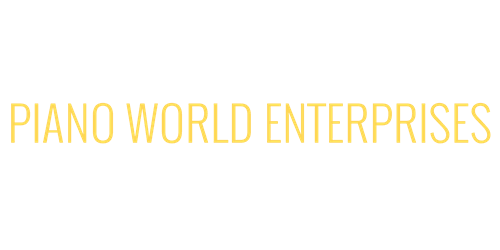 Piano World Enterprises has restored instruments from all over North America and has instruments in over 40 states at last count. People who find us are greatly relieved because all their local people have shut down or don’t work on these instruments. They just ship it or haul it to us for our attention.